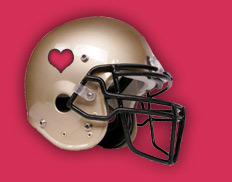 SuperBowlSingleGirl.com - Home of the world's largest personal ad! What do you do when you’re over the bar scene, when singles events are reunions of guys you’ve already dated, and online matchmaking turns up only a parade of losers and liars? If you're author and comedian Amy Borkowsky,you shift your love search into high gear and decide to run your own commercial to advertise for Mr. Right -- during the Super Bowl. The Super Bowl contender -- a 5-foot 6-inch, 110 lb.brunette -- says she hopes that along with online gifts via PayPal, a corporate sponsor will come forward to help her reach her goal of raising enough money to purchase her thirty second commercial. She is also considering such traditional fundraising efforts as a walkathon (“Maybe I’ll walk from my apartment to Kleinfeld’s Bridal Shop,” she suggests) and possibly a bake sale, though she admits, “To make a dent in what I need, we may be looking at a five-thousand dollar cupcake.” If Amy does not reach her $3 million goal and is unable to purchase a Super Bowl spot, all money gifted will be donated to the United Way. The never-married Manhattanite, a former advertising copywriter, has some thoughts about how she'd turn standard advertising techniques into a hard hitting appeal for a husband. “I’m thinking I could have testimonials from old boyfriends, side-by-side comparisons with other women who are on the market, or maybe a jingle,” she suggests. Read more about Amy and her goal! AMY HAS DONATED ALL FUNDS TO THE UNITED WAY charity, and fundraising is now over (but if you're a corporate sponsor who can help Amy advertise for a great guy on the next Super Bowl, do let us know.) 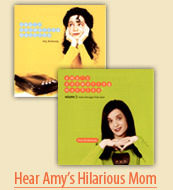 Follow Amy's latest adventures at Amyland.com, on Facebook or be one of her first Twitter followers: @AmyBorkowsky. Book Amy for a comedy or speaking engagement. If you can't make a monetary gift, referring your friends and potential corporate sponsors to this site would be just as appreciated!